Nights of Lights from the Water! Float away from the crowds and view St. Augustine’s spectacular holiday lights from the water on this delightful one-hour tour. 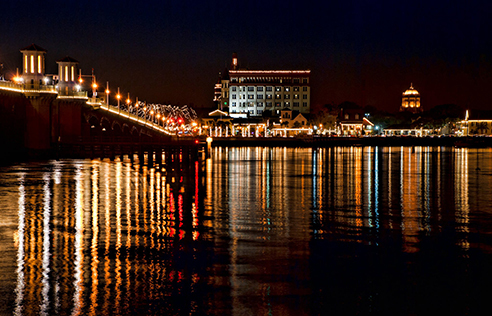 St. Augustine Eco Tours offers a special boat excursion to view St. Augustine’s Nights of lights from the rivers. These one-hour tours depart from the Municipal Marina at 6 p.m. and at 7:30 every night from November 17, 2018, to January 31, 2019. Up to 12 guests can experience the illuminated city in comfort and without the hassle of the crowds. The expert Captains of St. Augustine Eco Tours explain the points of interest and answer questions throughout this intimate one-hour tour. Guests enjoy comfortable seating on custom designed passenger vessels, no pontoon party boats. It’s a unique & relaxing way to take in St. Augustine’s spectacular lighting display, with the city skyline, lit up with three million twinkling white lights. Departs from the Municipal Marina (111 Avenida Menendez St. Augustine, FL 32084). Call (904) 377-7245 for reservations. One Hour Excursion CALL 904-377-7245 and get on the water today!